Mojo Installer is currently one of the most controversial programs on the web. While some question its features and others question its legality, there are certainly many great perks that allow users to improve their own experience with what iOs can actually do. Mojo Installer is a special kind of “app installer”, which enables users to download additional features. These modifications and customizations boost and improve upon the stock version of Apple iOs. 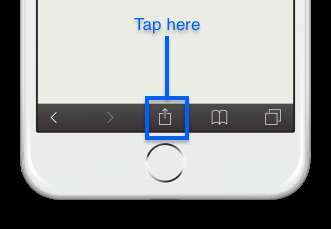 After the page loads up, press the “Sent To” or “UP” arrow-button on your screen. On an iPhone, the button you need to press is at the very bottom of the screen (see screenshot below). It should be a square with an arrow pointing UP out of it. Some people call this the “Send To” button. On iPad, it is at the top right corner of the screen. Then rename your app to Mojo and then press Add. Launch Mojo Installer from the home screen by pressing the app’s icon! After Mojo launches, use it to install apps on iPhone and iPad. Mojo Installer is an iOS app installer that allows you to download additional features on iOS devices like iPhone. The Mojo Installer isn’t exactly a “jailbreak” kind of thing, but just a way to really make the most of Apple’s content and improve on the standard features of iOS. There are other similar app installers out there, including one of the most popular names in the industry: Cydia. Cydia latter is considered a really great app, with the ability to provide a really wide range of amazing features. However, Mojo is a perfect non-jailbreak alternative for those who are looking for less invasive solutions to improve their iOs device, without taking risks and without violating the warranty of their devices, for example. The great thing about Mojo is that it is easy to use. Some people are actually quite afraid of using similar applications, because they do not want to go through tough and complicated processes to sort of hack their own iOS. However, there are many other ways to bring your device to the next level, even if you aren’t really savvy in terms of technology. Mojo is definitely easier to use for everyone, as it allows people to find the apps they want and download them from within Mojo in a super easy way. The great thing is that you don’t need any deep technical skill or coding ability in order to use Mojo and to make the most of it. Another perk is that mojo can also run without the Wi-Fi connection, which means you can still operate it offline. Popular throughout the world, Mojo is available in 5 different languages, and it offers the support of a very dedicated community. In case it was hard for you to understand what Mojo Installer actually does, let me try to make it a little bit simpler for you. In short, Mojo Installer is an app….which allows you to download other apps from within! “Why should I use Mojo?” you might ask. Can’t one just download the same apps straight out of Apple’s App Store? Well, there are actually a wide variety of applications that for a reason or another, are not actually available on iOS, meaning that you cannot download them through your AppStore with your AppleID. Mojo Installer is a great way to access all the apps that you might want to download. Many of these apps are, sadly, not available on the AppStore. Mojo also enables you to acccess additional functions that will allow you to improve the features of your iOS device. There are many clever add-ons or other boosters available, so check them out with Mojo!